It’s exciting to see your money double. And here are some tech stocks that could potentially do just that! BlackBerry (TSX:BB)(NYSE:BB) has transformed from generating most sales from handheld devices a few years ago to focusing on software and services today. This achievement is truly remarkable, with John Chen leading the company as executive chairman and CEO since November 2013. Today, the company’s area of focus is on mobile security, which is related to enterprise cybersecurity and embedded software with regard to the Enterprise of Things. BlackBerry’s US$1.4 billion acquisition of Cylance, an artificial intelligence (AI) and cybersecurity company, last month showed that it was serious about cybersecurity. Cylance’s embeddable AI technology is expected to speed up the development of Spark, which is BlackBerry’s secure communications platform for the Internet of Things. BlackBerry is still in its very early stages of growth. The Enterprise/Internet of Things market has a long growth runway. Currently, Thomson Reuters analysts have a mean 12-month target of US$10.90 per share on BlackBerry, which represents more than 22% near-term upside potential. However, if BlackBerry continues to invest in the right places, it can double your money a few years down the road. Shopify (TSX:SHOP)(NYSE:SHOP) is a rapidly growing tech stock. Its three-year revenue growth rate is 73%. Last year, it posted record revenue past US$1 billion. Shopify’s price growth persistence is amazingly strong. It’ll be very difficult for you to find a stock that outperformed it in the past three years. 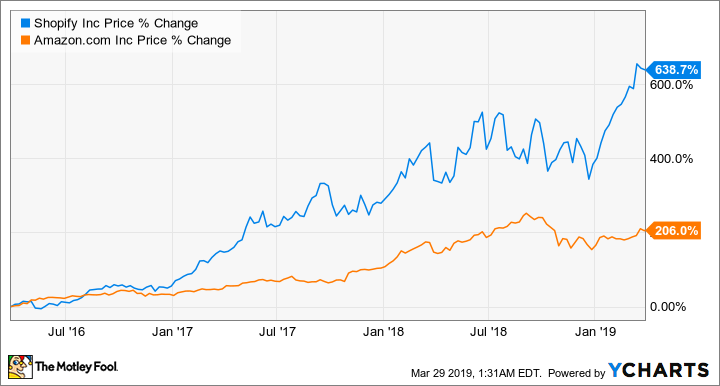 Here’s a chart comparing Shopify and Amazon’s three-year price performance. As you can see, there was simply no competition. After all, Shopify is at its early stages of growth — Shopify’s market cap is about US$22.5 billion compared to Amazon’s US$871 billion. Shopify continues to simplify the process for businesses to sell online via its cloud-based e-commerce platform. Initially, it focused on small to medium-sized businesses, but it has proven to take on enterprise clients as well. For example, Shopify successfully helped one of its enterprise clients create an augmented reality app to simulate how a product might look if it were placed at the shopper’s own home. This was exactly the shopping experience that its enterprise client wanted its non-in-store customers to experience. With aggressive growth stocks like BlackBerry and Shopify, it can be challenging to time the purchases correctly. The best course of action may be to simply average in over time and especially buy more on huge dips, which are common among these types of high-growth stocks. You’ve got to believe in the companies to be able to hold on to your shares, and if the businesses really pull through and continue to grow, you can do much better than double your money. John Mackey, CEO of Whole Foods Market, an Amazon subsidiary, is a member of The Motley Fool’s board of directors. Fool contributor Kay Ng owns shares of Amazon, BlackBerry, and Shopify. David Gardner owns shares of Amazon. Tom Gardner owns shares of Shopify. The Motley Fool owns shares of Amazon, BlackBerry, Shopify, and Shopify. Shopify and BlackBerry are recommendations of Stock Advisor Canada.